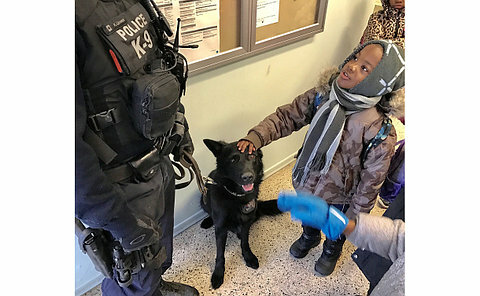 Kids who participate in a police-community safety program got the chance to meet a police dog up close. The Mornelle SafeWalk program has been running for over five years and has had hundreds of kids from the community take part in the walk and the homework program that began to ensure kids get to and from school safely. 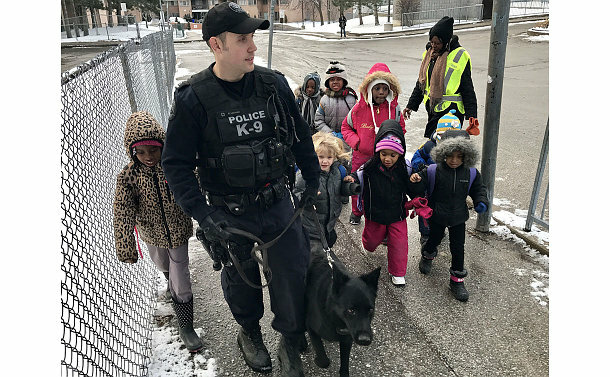 On February 1, Constable Kevin Lisowski and his canine partner Yukon attended the morning walk and interacted with students, staff, and everyone else who happened to stop by. 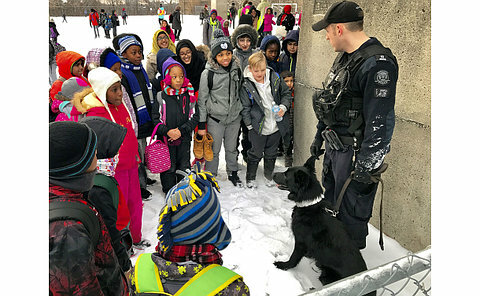 None of the kids have ever seen a police dog in person and they were absolutely delighted. Parents and students asked lots of questions which Constable Lisowski patiently answered. Even parents who just happened to be walking to school with their kids stopped to take photos and ask questions. One of the organizers, Angela Brackett said some of the students are calling it the best SafeWalk ever. A week later they still talk about Kevin and his dog Yukon.